Remember how incredible signing day used to be? The highs/lows of the recruiting process was such great drama. Laquon Treadwell, XLK, and Perrish Cox stick out as memorable signing days – some more fun to remember than others. • Loved these thoughtful words on the experience of being a sports fan. Sports fandom isn’t simply a tribal reflex; it helps uncover the essential and happy impurity of aesthetic enjoyment. There’s always an emotion, something arbitrary and particular, behind the judgment that something is beautiful. Something about this brought to mind my first OSU sports memories. Just looking down on old GIA during a long defensive possession while someone steadily turned up the volume as Eddie’s boys hugged the life out of an offense, leading to a turnover and watching the lead man (Mo Baker, Vic Williams, Desmond Mason) fly down the white maple to hammer it home. It was beautiful to watch the players’ resolve, the long-standing endurance as they were crowned with cheers into the ensuing timeout. • With the arrival of college football’s signing day, here’s the only thing I’m concerned about: signing Deondrick Glass. I’ll be mildly surprised if any other (2019 football recruiting) news comes out of Stillwater today. • Here’s what Cowboy Basketball is missing – a guy who can do what Marcus Smart did to the OKC Thunder on Sunday. Then came Sunday, when the Celtics beat the Thunder 134-129 in Boston. Smart made six of 11 shots, four of nine 3-point shots, had four rebounds, seven assists and 18 points. After the Thunder took a 78-76 lead in the third quarter, Smart nailed back-to-back 3-pointers to restore the lead to Boston. Moments later, Smart hit another trey to give the Celtics a 12-point lead. The capacity to make the play(s) that turn a game are huge – an invaluable intangible asset. Inserting yourself at crucial moments and imposing your will on a game, defining the fate of both teams in position to yourself. Marcus Smart made sure OSU won games. He’s making sure Boston wins them. OSU needs a broad set of shoulders who can define outcomes. • A more efficient use of Yor Anei could help to buoy the Cowboy Defense – something Boynton has been effectively tinkering with lately. Despite the Cowboys’ home loss to Kansas State on Saturday, Anei had nine points, five rebounds and one foul through 31 minutes. Like many other freshman athletes, Anei has struggled with fouls. In each of his first five Big 12 games, he committed at least four. 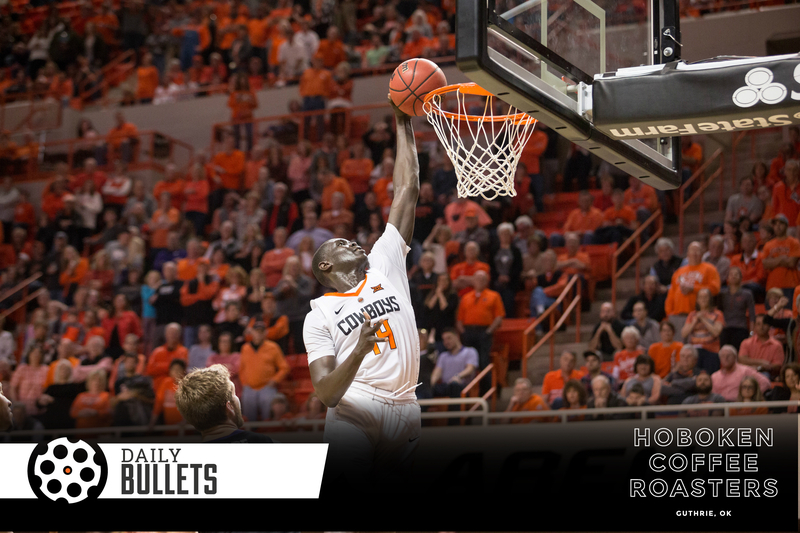 Anei has picked up no more than three fouls in each of the Cowboys’ past four games. • Today in Sports Gone Bad: Take a look inside the ADIDAS world of paying high school players. It’s unreal to think about how certain companies have “worked around” the rules to get better results. Also – Art Briles doesn’t belong on a college campus again and how Baylor happened. • How signing day predicts the next national champion in college football. • Finished this fun, government-conspiracy thriller earlier this week. A fun distraction for those looking to divert their attention from college basketball. • These thoughts on boredom (in the context of a greater article about how kids today don’t experience it) are fantastic. Of course, it’s not really the boredom itself that’s important; it’s what we do with it. When you reach your breaking point, boredom teaches you to respond constructively, to make something happen for yourself. But unless we are faced with a steady diet of stultifying boredom, we never learn how. • The Milwaukee Bucks went from mid-tier to leading the Eastern Conference by modernizing/overhauling their shot chart. The power of a good, effective coach (and an MVP candidate) can’t be overstated.